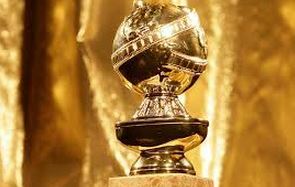 The Golden Globes were really Golden tonight as they hit many high notes I predicted they would! 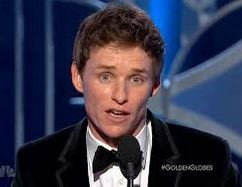 Congratulations to Eddie Redmayne for winning the most competitive battle of the night. For Best Actor Drama. For his searing, unforgettable portrayal of the multiply disabled astrophysicist Stephen Hawking in the great “Theory of Everything” which also won best score tonight. 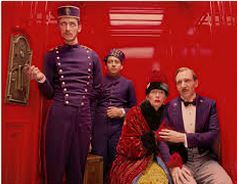 And to Wes Anderson, the red-headed, long-haired wizard for winning another hotly contested category Best Comedy/Musical and then gave a hilarious acceptance speech that matched the great humor in his movie. Anderson thanked many, many members of the Hollywood Foreign Press by FIRST NAMES! Hysterical! And almost unpronounceable. “Boyhood” also as expected won Best Picture and as I reported, earlier in the night, also won Best Director for Richard Linklater. Moore, Linklater, “Boyhood”, Arquette and Simmons will also now go on to win their Oscars. So the big win of the night was “Boyhood” with three wins. For Best Picture, Linklater and Arquette. Tied with two each are “Theory of Everything” Eddie Redmayne and Best Score. And “Birdman” also got two awards for Best Actor, Keaton, and Best Screenplay. Now, come Eddie! Let’s go on to the Oscars and let’s win there, too! !